Gledhill’s Annual Family Fest – Just over 3 weeks away! Posted on May 23, 2017 | Comments Off on Gledhill’s Annual Family Fest – Just over 3 weeks away! It’s almost time! 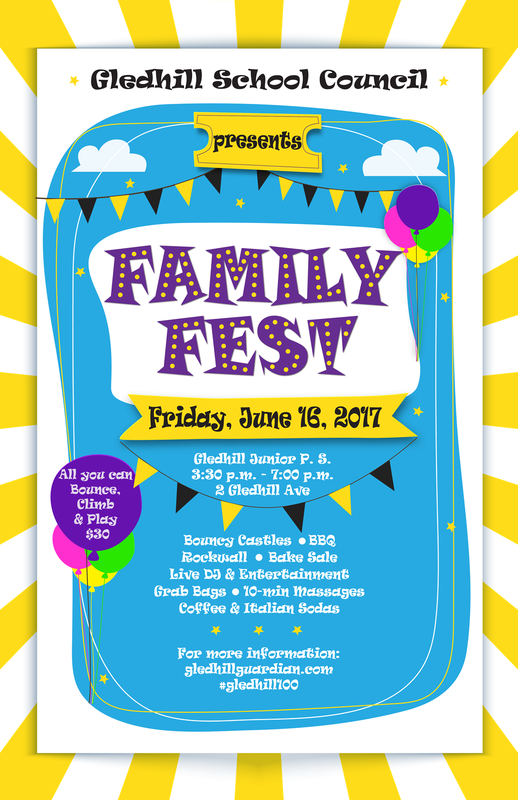 Don’t miss Gledhill’s Family Fest June 16th 3:30 to 7pm. Wristbands are back … This year for $30 your child can Bounce, Climb (The Rockwall) & Play until it’s time for bed. Wristband discounts for our Gledhill Families will be 2 Children = $50 and 3 Children = $70. We will be selling Wristbands & Tickets on the morning of Thursday June 15th and 16th. And again at Lunch on the 16th. For those needing to relax, stop by the Hand & Stone Danforth tent for a 10 min massage – only $10. Looking for a little pep in your step? Head over to Old’s Cool General Store table for some Coffee and Italian Sodas along with some great buys. Need something to feed the family? Step on up to the BBQ stand where Davidson’s Valu-mart has some delicious Burgers and Hot Dogs waiting for you. Don’t forget the Popcorn and Cotton candy afterwards or our Famous Bake Sale and Food Tables where even the picky eaters will find something they love. This entry was posted in Fundraising, School Event. Bookmark the permalink.